AS LIAM Kerslake waits with Peter Vowles among the sea of empty seats for his induction into Year 7 at Kepnock State High School, a wave of nerves washed over him. 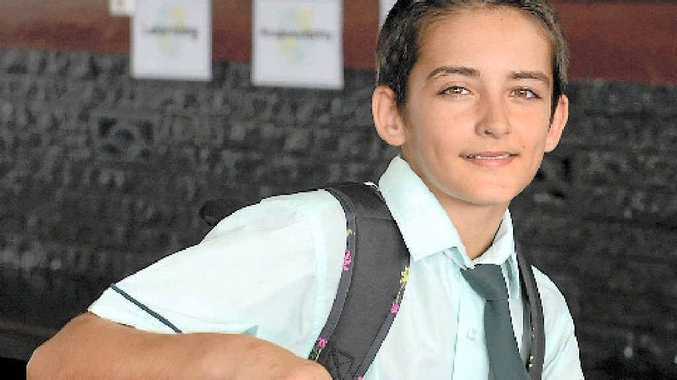 He only just finished Year 6 last year and Kepnock is much larger than Woongarra State School primary was, there are lots of new people to meet and he worries that subjects may be difficult for him to learn. But as Liam stretched out an arm and grabbed on to the shoulder of his Woongarra primary school mate who joins him at Kepnock, he said it was friends who would make the journey easier. Although Liam joked that for his mum, his early transition into the tie and formal uniform of school was a step too far forward. "She's over-reacting," he laughed. "She thinks I look like I'm going for a job application." Kepnock State High School principal Jenny Maier said the school did not quite anticipate how small many of the new students would be. "We ran out of the tiny uniforms," she said. "We underestimated." With a redesign of formal uniforms for the junior school this year and two cohorts of new students, Ms Maier said uniform demand was high. It is Kiara Doyle's first year at high school too, although she won't be the baby of her school coming from Year 7 at Walkervale State School. But Kiara laughed as she said her height would see most other students mistake her for a new Year 7. Keanu Neilson will also join Kiara in Year 8 and said he was "a bit scared". "But I guess you just have to deal with it," he said. Walkervale Year 6/7 teacher Anne Davie has also made the transition and will join the students at Kepnock High School. "I'm nervous too but terribly excited," she said. "I'm looking forward to being part of the big change." Ms Davie said her students wouldn't be jumping right into the curriculum. "I think it's important to make them feel comfortable," she said.